Book Blog Watch: The Perpetual Page-Turner has a link list to 2010 Book Surveys from multiple book bloggers, including my Gift Book Suggestions from 2010. Steph Su is listing best 2010 books by genre, craft etc. Happy Reading! 2 week blog vacation: next post January 5, 2011. This post is my holiday card. Happy holidays to you and your family. Enjoy your vacation. How beautifully serene it all looks. Have a great vacation! And from Tennessee-enjoy the holidays! Beautiful. And probably much colder than it looks! Thanks for these lovely photos! I've read your previous post and found it very interesting. I'd think switching point of view would be an indispensable element as plots become more complicated. "my dual voices to show that English ～ divided between the US and the UK"　How interesting! Enjoy your holidays. I, too, will be taking a break from blogging from this coming Sunday 19th December. I love your photos. Well, you should know that by now. What I like the most about them is that you show your local area in all seasons. 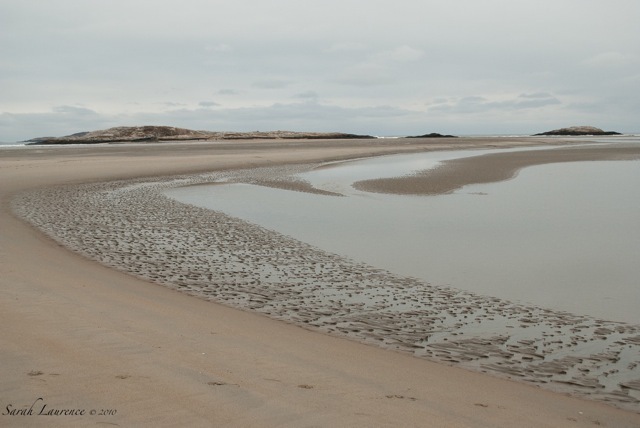 It's hard to believe that this is the same beach you photographed last summer. It looked so vibrant then and now it looks so cool and distant, but not less beautiful. I miss the sea and your photos are a way of keeping my acquaintance with it. Many thanks. Merry Christmas and a Happy New Year to you and your family. Just lovely. Makes me want to walk for miles along that shore. Happy holidays to you. Hope the days are filled with warmth and cheer. I adore these photos Sarah! Amazing photography!! My first reaction was wanting to be there, and then I began imagining a peaceful, inviting bedroom decorated in the colours of the second photo. There is something about sand (beiges/browns) and water (cool blue/greys) that just lowers my heart rate and blood pressure. Lovely!! Have a wonderful break. Look forward to enjoying more of your talents, as shared on this blog, in the new year. The year is retreating like the tide, and it's a good time for a break. I hope you enjoy yours. Happy Holidays Sarah! May the light of the Winter's Solstice and the New Year bring you and your family Joy, Peace and the best of Good Health. Have a wonderful break. Looks like you had a lovely walk. It is so beautiful there in your world. I absolutely love that first photograph, especially. I need to carry that image in my mind's eye. I was just thinking of you. I did a big Amazon order and got The Indigo Notebook, Hunger Games and One Day -- all from your recommendations, of course. The girls both of have LOTS of work to do over the holidays so some pleasure reading will be very welcome. Very happy holidays to you all, but I will be in touch via Christmas card and email. All, thanks so much for your holiday wishes and kind words of praise. This post is the closest I got to a holiday card. Sad but true. I’m still trying to finish up MS revisions before the kids are home for vacation. We haven’t sent holiday cards in the years since I started writing full time and blogging. I’m pleased to hear that my images are soothing during this busy time of year. ACIL, interesting observation about the colors. 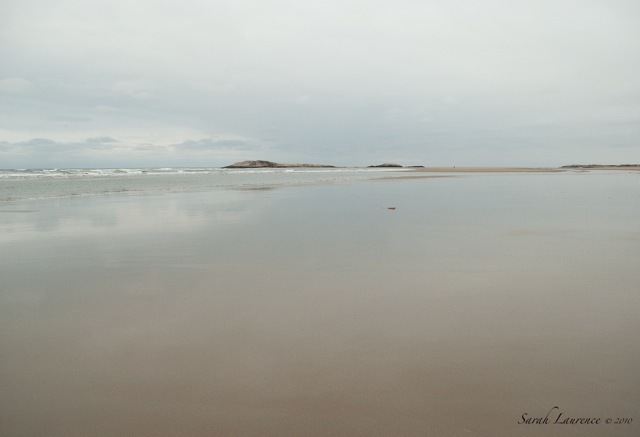 I just clicked on the Popham Beach label to view past posts. It is washed out and dark in December, but the colors will pop once snow falls and blue skies return in January. I’ll post again when it does. Bee, I’m thrilled to hear that my recommendations made your list. I’d love to hear what you and your daughters think of the books. Your husband would like One Day too; mine loved it. It's our generation. Looking forward to catching up and sorry about my universal failure on the holiday card front…maybe next year. You are the best card sender. Beautiful scenes--I can't believe you don't have more snow! Enjoy your break--wishing you and your family a happy holiday season! Love your peaceful pictures and I wish you and your family a very happy holiday! I love the mute tones of winter! Lovely photographs. Have a wonderful Christmas and New Year, Sarah! Such a privilege to live here...glad you do, too! so peaceful! Enjoy your blog vacation and Happy Holidays! All, thanks for your holiday wishes! I just added a link to more best books of 2010 posts and a silly YouTube clip “The Digital Story of the Nativity” that my dad sent me. Wishing you and your family a wonderfully happy and blessed holiday! Lovely pictures. Thank you! Pics like this make me so darn glad I live here. Even when its cold. Enjoy your holiday!!! Those pictures are so gorgeous ... love the blue and brown colors. I've been away from my blog due to work stuff for the past two weeks, but have been meaning to comment on your comment on my blog re: Longfellow ... your connections to him just blew me away ... so fascinating. Thanks for sharing those! Oh, that looks cold and isolated, but intriguing at the same time. I would like to put on my boots and go for walk. Merry BELATED Christmas SArah and a VERY HAPPY NEW YEAR! Such peaceful photos...A Happy and Peaceful New Year to you as well. I found you through your picture of an April violet and so enjoyed reading your blog and seeing your art. I wish you a lot of creativity and every happyness for the New Year! No doubt Laetitia de Haas was inspired by the Christmas pudding in her painting, but the recipe is truely of American fruit cake. It was sent to us in 1959 from Oregon and made in a little factory in Sherwood. I found the recipe in an old Ladies Home Journal. What happened at the auction of your paintings? I must update my reading on various blogs. Have a wonderful year in your beautiful environment. Happy New Year, also from Maine!! Happy New Year, Sarah! May 2011 be wonderful for you! Jacoba, Geukkig Nieuwjaar to you too! I loved hearing the story of how you found my blog - an April violet is perfect. Thanks too for giving me a translation of the story behind the image. I sold your favorite painting ("High Tide at Lookout Point") at the 10X10 Art Show. The other painting I’m giving to the kind vet who made a house call to put Stella to sleep. The skating photo is hanging in my daughter’s room since it is of her. I also bought a piece of artwork myself by Catherine Worthington. Less than a quarter of the work sold at the show, but it still managed to raise good money for the charity. Beautiful images as always. My husband reads on his iphone but I have not made the digital switch yet.